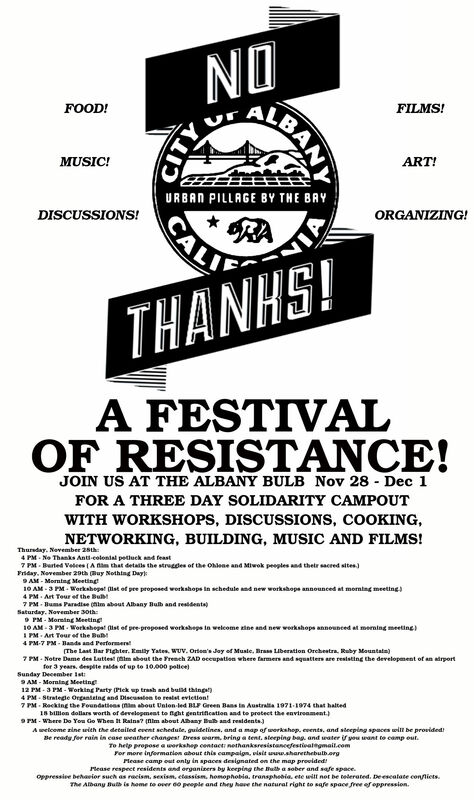 Join us at the Albany Bulb Nov 28 – Dec 1 For a Three Day Solidarity Campout With Worksops, Discussions, Cooking, Networking, Building, Music and Films! 11am – Resisting the development of Knowland Park – John R.
1pm – Art Tour of the Bulb. Featuring Amber and Osha. Explore the art and history of the Bulb with two seasoned guides. 4pm – 7pm – Live music. (The Last Bar Fighter, Emily Yates, WUV, Orion’s Joy of Music, Brass Liberation Orchestra, Ruby Mountain, TBA). Solidarity Potluck: 12:00 noon and 4:00 PM. Come join us for The No Thanks Resistance Festival and three day Camp-out to defend the Albany Bulb from Eviction! See the Flyer for the schedule of events! Schedule updated to the event page tonight! Workshop proposals should include if you want to do it on Friday or Saturday, What time between 10 AM and 3 PM, things you need from organizers, and the title of your workshop! Existing workshops include: Know your rights training – Labor, the Working Class, and Housing – Towards An Ecological General Strike – Tarsands Blockade – Direct Action Training – The IWW EUC, The BLF Green Bans, and Working Class Strategies to Halt Gentrification and Ecological Destruction – ect. We request more workshops and skill shares about Class Struggle, Environmental Justice, Gentrification, Food Justice, Natural Building / Cob Building, Anti-Repression, Parkour, Accountability and Conflict Mediation, Cop Watch and Know Your Rights, Radical Theory, LGBTQ, Indigenous Struggles, Guerilla Gardening, Carpentry, Squating, Direct Action, Graffiti, Screen Printing, Flyer Making, Facilitation Training, DIY, Hacking, Bio-Remediation , AgroForestry, Bike Maintenance, Welding, Workplace Organizing, Labor History, Herbalism, Street Medic Training, Native Wild Edible And Medicinal Plants, Homesteading, Child care, Consensus, Feminism, Bay Area Radical History, Journalism and Alternative Media, Punk Rock, Poetry, Writing, Self-Defense, Decolonization and Post colonialism, Mutual Aid, Jail Support, Land Reclaimation, Jewelry Making, Gift and Trade Economies, Student Unionism, Spokeland and ETC! Please forward to anyone or organizations you think would be interested! For more information about the struggle to save the Albany Bulb visit us at: http://www.facebook.com/ShareTheBulb or http://www.sharethebulb.org! Help us organize a public meeting on Debember 5th about what’s happening with our Post Office! Tree weeks ago the Planning Commission passed on to the Berkeley City a proposed Zoning Ordinance that would make the Post Office property less desirable to potential purchasers of the capitalist variety. We are still waiting for action on this from the City Council. Come and help plan our next actions in defense of our post office and against privatization. 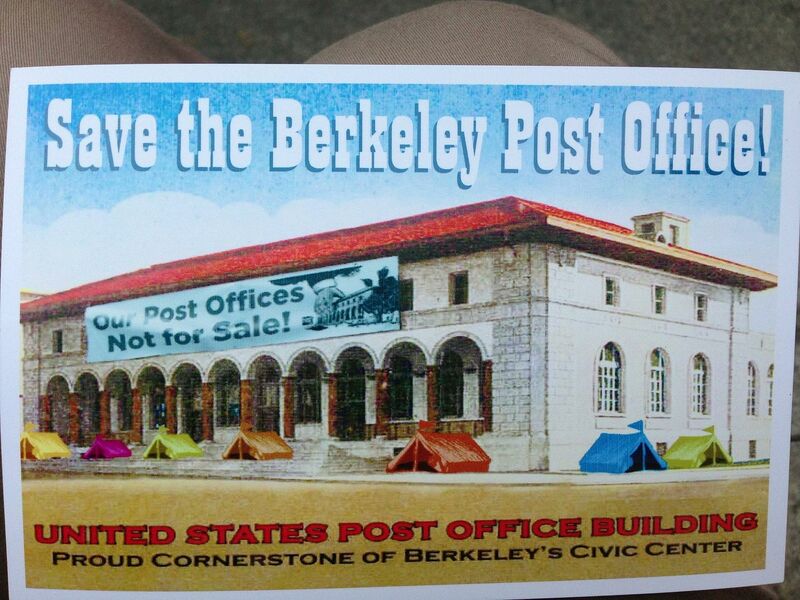 We want to send a message to CBRE, the Post Office and Berkeley politicians that the sale will not be tolerated! Check out the video of Peter Byrne’s talk at our latest Save the Post Office Rally! with members of Community Democracy Project. What would a city look like if the residents had a say in how the city’s budget was spent? How could this be implemented? What specific legal measures and institutional structures would be necessary to make this happen? How would this change a city and how we relate to each other? Community Democracy Project is currently gathering signatures to amend Oakland’s City Charter in order to take back Oakland’sOne Billion dollar budget, put it into the hands of the community and out of the hands of the usual gatekeepers, politicians, and vested corporate interests. It’s a campaign to create real democracy through dialogue, community building, education, and most of all, by taking back ownership of our own tax dollars. Core members of CDP will share insights, approaches, history and philosophy of participatory budgeting, and discuss this necessary transformation that can fundamentally transform our communities. CDP will explain why and how you should join this movement. Donations to Occupy Forum to cover costs are encouraged; no one turned away! We held our Town Hall meeting to discuss the need to get rid of the Alameda County Sheriff and District Attorney on Tuesday, November 5th. Now we’re talking about the nuts and bolts of such a campaign while searching for the right candidates. Bring your organizing hat, your ideas, and your friends! 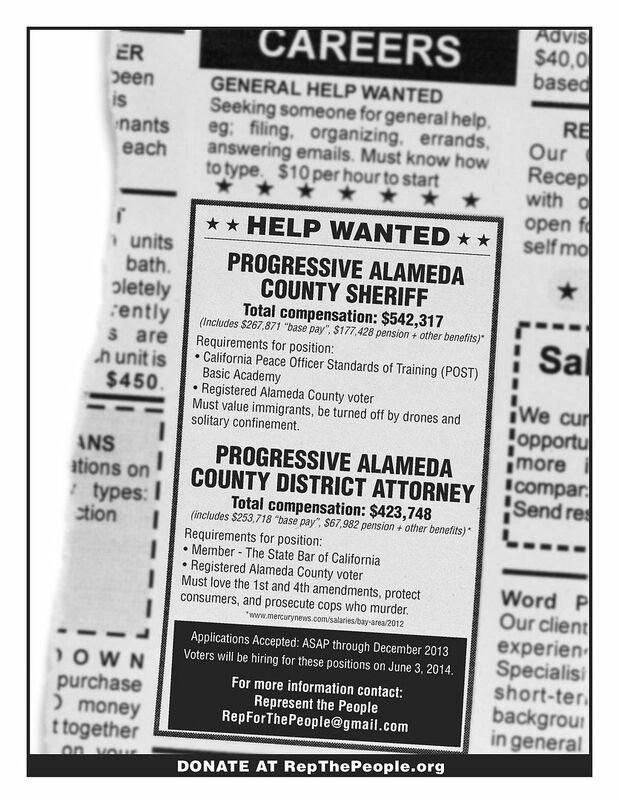 Let’s replace Ahern and O’Malley with real progressives, dedicated to the welfare of all Alameda County residents. Jill Ravitch is the District Attorney for Sonoma County, where Andy Lopez was murdered by Deputy Gelhaus. Gelhaus has not yet been indicted for his crime. We will protest at a Campaign fundraiser for District Attorney Ravitch’s re-election. Here we will make our presence known! We will not stand by while Ravitch refuses to do her job. She must uphold her sworn oath to uphold the law. She must do right by her community by fulfilling her sacred duty to protect and serve the citizens of Sonoma County. She must arrest Gelhaus immediately! There will be another event, Light Up the Night for Andy Lopez, at 8:00 PM. This is a march scheduled to take place on the 3rd of December, starting at 8:00pm. We will rally at The old court house square, and march up Santa Rosa to the Sheriffs dept. (unless people within the group “action for andy lopez” would like to start at a different location. This is Your march. This is Andy’s march so all input is welcome.. This is intended to be a peaceful action, but also an action to let the city of Santa Rosa, as well as the Sonoma County Sheriff that we will not let up, and that we will be heard. December 3rd should be a historic day in Santa Rosa. There is also an earlier event “No arrest=No Elect” taking place at 4:30pm. This is a protest that will be held at the location of the District Attorney’s fund raiser, which she is having to raise money for a re-election campaign. Most of us will be attending this action, and then follow it up with “light up the night for Andy Lopez. Deputy Gelhaus may think that he killed Andy Lopez…… but he did not. Andy lives on now and forever in all of us who have been touched by this tragedy. Andy’s light will not go out, and we will be his light,3) The fear factor of this gang called the police, needs to be removed from the youth EVERYWHERE . This will help build these kids up, just as all previous and future actions that they take part in will. on December the 3rd….. We suggest all participants where black. This is not only as a symbol of mourning, but also a show of unity. We will be one on this night. To Andy’s Friends, schoolmates, peers, etc…. Ride your bikes, skate boards, scooters, or walk. Just be there. If you have a flashlight bring it. Bring pots, pans, bullhorns, or anything else to make yourself heard. Together we will bring light to the darkness in the Name of Andy Lopez. Please mark your calendar to join Communities for a Better Environment, the Sunflower Alliance, the Richmond Environmental Justice Coalition, Idle No More, 350BayArea, Occupy, and many others for a rally at the Bay Area Air Quality Management District Board Meeting. We will rally at 9:00 a.m. and then go inside for the Board meeting at 9:45 a.m. The Board will receive a report, that we have requested, to address the linkages of all of the Bay Area proposed Crude by Rail/Refinery Projects. We believe staff will try and downplay the connections and deny the Oil Industry has a Master Plan for the Bay Area Refinery Corridor. Staff has been caving into the Oil Industry on the Regional Green House Gas Emissions Rule. It is imperative we let the Board members know the community is deeply engaged in these issues. We need to show support to our allies on the Board who want to see Bay Area Green House Gas Emissions reduced substantially. Contact me, Andrés Soto (andres@cbecal.org, or at 510.282.5363) and let me know if you would like to help plan the rally. This should be a relatively simple affair. Pass the word to your friends, family and allies who are concerned about Climate Change and have them join us and/or join in the planning. I will schedule a planning meeting as soon as I hear from a critical mass of folks. It would be great to have our signs and banners for this one as well as a solid media strategy. A delegation of us from Richmond will arrive by BART. We will meet at Richmond BART at 8:00 a.m. to catch the train and get off at the Civic Center BART Station. Hearing starting at 9am, rally at 1pm, lobby visits in the afternoon. On December 4th, Sheriffs throughout the state will be begging the Board of State and Community Corrections for millions of dollars to build more cages for our children. Come to Sacramento and help us show that communities across the state are united: No New Jails! Over 33 of California’s 58 counties have plans to build new jails. While some of them claim to be reformers, we know we won’t be able to pass sentencing reform or bring our loved ones home unless we stop building cages. These projects put our counties in fiscal jeopardy, and steal resources from the life-affirming programs and services that get people out of jail and keep them out. What happens December 4th will determine whether counties build new jails or reduce their jail populations. But, as usual, what they aren’t counting on is us. We’re going to pack the hearing room with as many activists as we can possibly mobilize. LowPayIsNotOkay website (find an event). Against all odds, Fast Food Workers are organizing. In one lunch hour, you could create a tipping point for their campaign. A whopping 52% of fast-food employees’ families are forced to rely on public assistance to put food on the table or see a doctor. That means American taxpayers are putting about $7 billion a year into fast food corporate profits. Workers are taking an enormous risk — for all of us. They’re asking us to give just one lunch hour to show solidarity and help spread their movement to new cities. Search for a rally near you and sign up to attend or to help organize. The Berkeley Community Heeds the Call for a Grand Alliance to Defend America’s Right to a Vibrant Public Postal Service! John Postal Workers, Berkeley Post Office Defenders, Strike Debt Bay Area, the Green Party and others interested in protecting our hard earned public resources from the profit pirates of privatization. 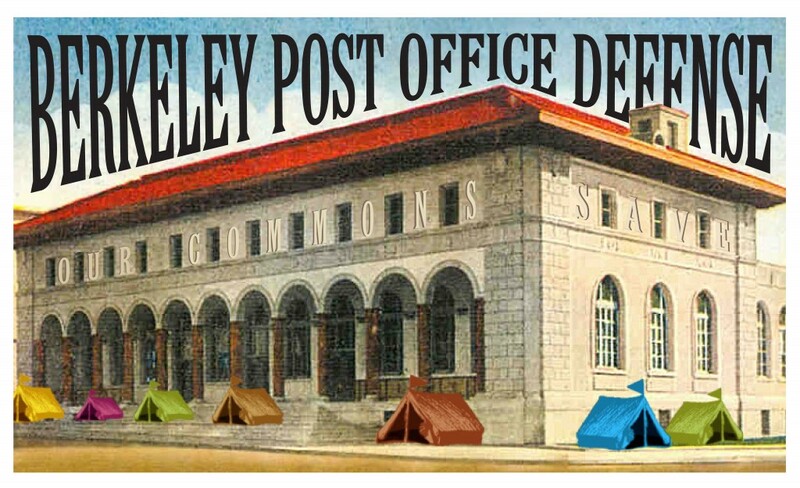 We are gathering to discuss the next steps in this ongoing campaign and ask you to come help us formulate solutions to save our commons, in particular the Berkeley Post Office which is on the auction block. Come learn more about our legislative, judicial and direct action tactics. Discuss how to bring democratic pressure to bear on Berkeley’s elected officials to pass a zoning overlay which would impact the ability of the Post Office to sell the downtown property. Learn more about the toxic strategy of the privateers who hope to sell off the entire Postal Service. Contribute your energy and ideas. Statement by APWU President Mark Dimondstein. December is Alan’s birthday month & it’s the holiday season of giving, so in that spirit, this month’s 1st Friday at the Alan Blueford Center 4 Justice is dedicated to the food & toy donation drive. Dec 6th will only be the 1st day the donation drive, after that, we will be collecting donations from M-F noon-6pm at ABC4J which is located at 2434 Telegraph Ave; the donations can be toys and non-perishable food items which will be donated to the Mary Ann Wright Foundation which carries on the work of Mother Wright. As a special holiday bonus, FRESH JUICE PARTY will be playing inside ABC4J for Dec’s 1st Friday!!! Please help us spread the word about The Alan Blueford Center 4 Justice Holiday Donation Drive! First Friday: Oakland Privacy Group Exhibit and Outreach Against the Domain Awareness Center. @ First Friday - We'll be somewhere in the mix! Join Oakland Privacy Group peeps as we pass out literature, show a slide show, perhaps have mock-up surveillance units and discuss our opposition to the Domain Awareness Center, Oakland’s implementation of ‘1984’ on steroids. Join us also for our next meeting at the Sudo Room on December 11th. Fighting the proposed curfew in Oakland. Protesting in Sacramento on O22. Demanding that Kamala Harris investigate the death of Alan Blueford and all other victims of police violence here in California. Speaking out against the militarization of police. Organizing a food and toy drive for the Holidays for the neediest amongst us. Join as as we review our recent actions and plan future ones! Hear John Parker, Workers World Party National Committee and International Action Center West Coast Coordinator, lead a class on Lenin, Self-Determination and The National Question. There will be lots of opportunity for discussion and questions. 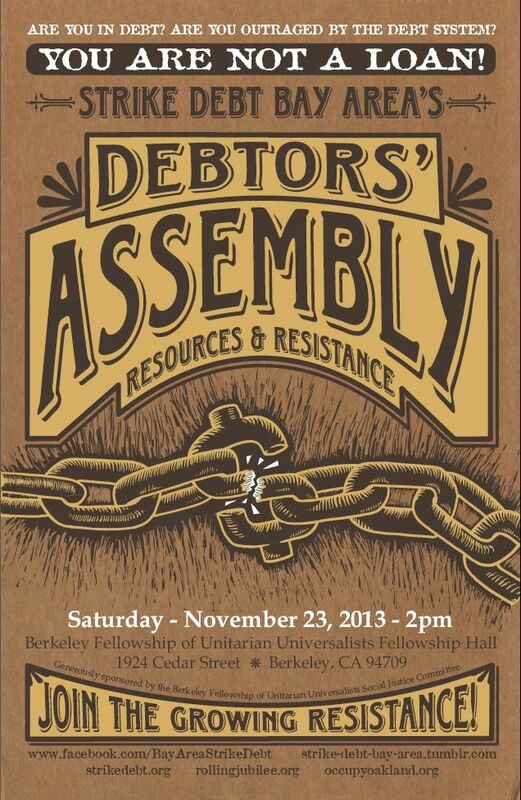 Join Strike Debt Bay Area in working on some exciting projects locally and nationally to fight unjust debt. 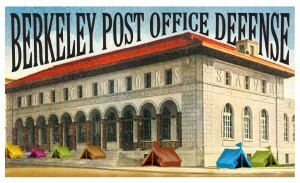 – The latest on our coalition efforts to Save the Berkeley Post Office and fight the privatization of our commons. Watch the video of Peter Bryne speaking at our September 28th rally on the steps of the historic downtown Berkeley Post Office. – The latest on our efforts to help Richmond and NGO allies push for principal reduction for Richmond’s homeowners. Read an article written by two Strike Debt Bay Area members on the Richmond principal reduction / eminent domain case. In addition, we are exploring the use of a public bank to help Richmond, CA and other communities escape the thrall of Wall Street. – Other projects include efforts to fight against student debt in conjunction with peeps at UC Cal, action to bring awareness about the Federal Reserve on our near it’s hundredth birthday on December 23rd, 2013, a Debtors’ Union, a book group with semi-weekly discussions, investigations into the legitimacy of mortgage ownership and therefore the right to foreclose, efforts to thwart payday loan usury and more. Check out our website, our Facebook, and follow us on Twitter.